When monsoon floodwaters covered vast swathes of the Malaysian peninsula, it forced Ismail Mustafa, his elderly wife and their seven-year old grandson to run for higher ground. The water rose so rapidly – almost an inch every five minutes – that even on high ground they were soon surrounded on all sides. The family became stranded on a tiny island that was shrinking before their eyes. Fortunately, they were rescued and taken to safety by a neighbor who had a boat. The family then spent days living in an old railroad station until the waters receded. When the family were finally able to return to their village, they faced a terrible shock. Amidst the mud and debris strewn around the village, they couldn’t believe what they saw. 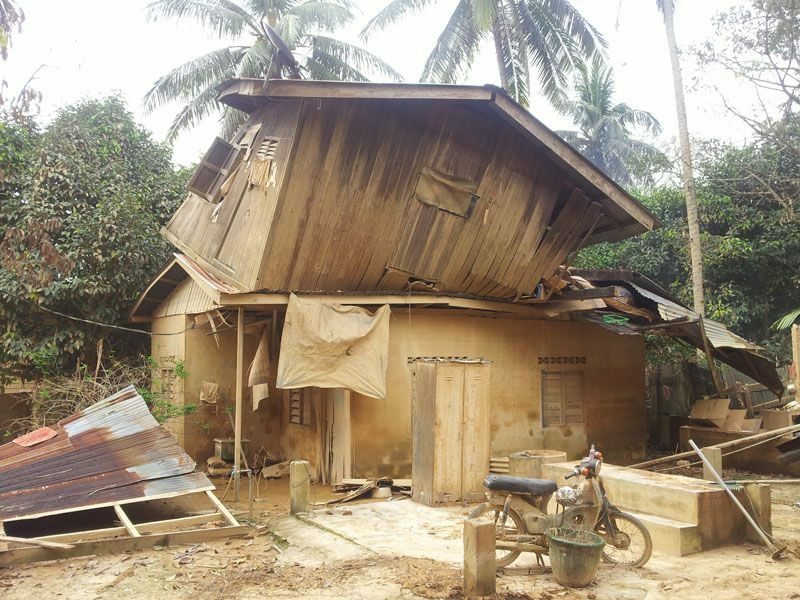 Another house had been swept away from its foundations and had landed right on top of the Mustafa family home. Entering their dilapidated house now meant taking their lives into their own hands. It was a risk they couldn’t – and shouldn’t – take. Their home, and all of their belongings, were now lost to them. Thanks to donations from amazing people like you, we were able to support the Mustafa family. Our Response Team provided them with a ShelterBox containing essential items such as blankets, solar lights and water filters, and put up a family-sized tent near their old home. This meant that the family could stay in their close-knit community and start to rebuild again, rather than returning to the old railway station. With the help of friends and family, they will be able to dismantle the dangerous building and start to clear the ground for a new home. Your support means that we can help people like Ismail and his family to start the process of recovery after disaster strikes – and transform despair into hope.